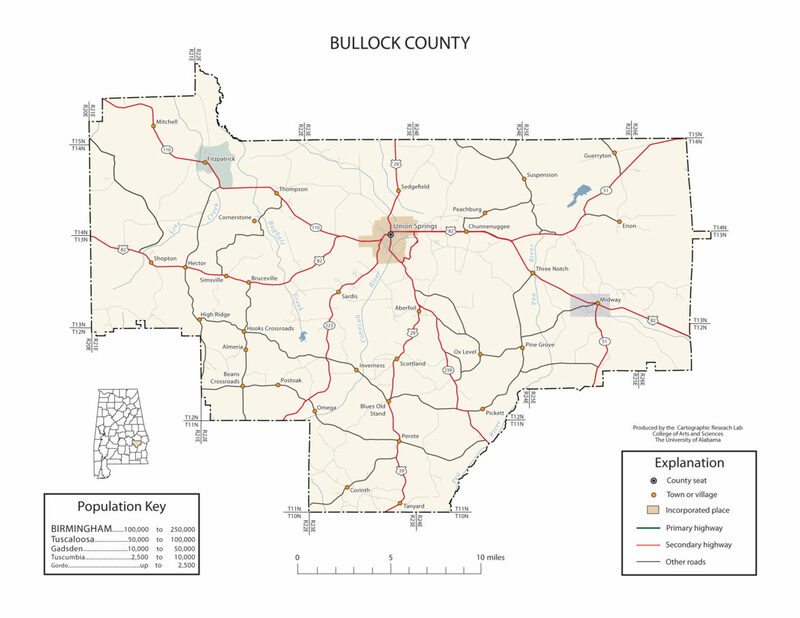 Bullock County Alabama has a population of 10,914. In 1867, Union Springs was chosen as the county seat. Its name is in honor of Colonel Edward C. Bullock of Barbour County. The area that became Union Springs was first settled by white men after the Creek Indian removal of the 1830s. Twenty-seven springs watered the land, giving rise to the name of Union Springs. The city was incorporated on January 13, 1844. When Bullock County was formed in 1866, voters selected Union Springs as the county seat. Union Springs is located in southeastern Alabama near the center of Bullock County. The city is located at the intersection of U.S. Route 82 and U.S. Route 29. Route 82 leads east 40 miles to Eufaula and northwest 46 miles to Montgomery, the state capital. Route 29 leads north 23 miles to Tuskegee and southwest 40 miles to Troy. The source of the Conecuh River is within the city limits. The earliest settler in Midway, originally located in Barbour County, was likely Samuel Feagin, who became a land broker and the first postmaster. Feagin’s son, James Madison Feagin organized the Midway Guards during the Second Creek War (1836-37) when many homes in the area were burned and settlers were driven off their land by the Creeks. The outfit would become the Midway Southern Guards and join the Fifteenth Alabama Infantry Regiment, which fought in many important Civil War battles in Pennsylvania, Tennessee, and Virginia. By 1838, the first post office had been established, and the area apparently was already called Midway. The Battle of Pea River, a conflict during the Second Creek War (1836-37), took place in the area in 1837. Blues Old Stand is an unincorporated community in Bullock County. The main road through the community is U.S. Route 29 in Alabama, but also includes Bullock County Roads 14 and 19.